I’m not sure what I’ve got to confess that a) I’d want to share and b) what you’d want to read?! 1. I’m a tv addict. I’m pretty sure I’ve mentioned this at some point before, but I really am. Anything nice and cheerful such as Criminal Minds, CSI or Grey’s Anatomy is a lovely evening in by myself. Mr H and I love to spend a cozy evening in catching up on Eastenders or Casualty. 2. I’m not sure I should even admit to this, I’m taking a risk at being labelled a very bad Brit. I can’t stand tea! The smell alone makes me heave, let alone the taste. I don’t like coffee either, though I do at least like the smell. I’d happily sit in a coffee shop for the afternoon, but I wouldn’t want to drink the stuff. 3. 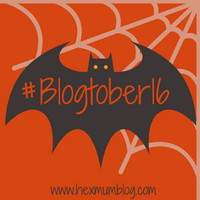 I’m pretty bloody proud of myself for getting this far in Blogtober!! Can’t believe I can see the finish line, this month of them all. I really hope I can keep up with the organisation and make posts more regular. I certainly won’t be making it everyday throughout November too, but there shouldn’t be any excuse not to post at least once a week!